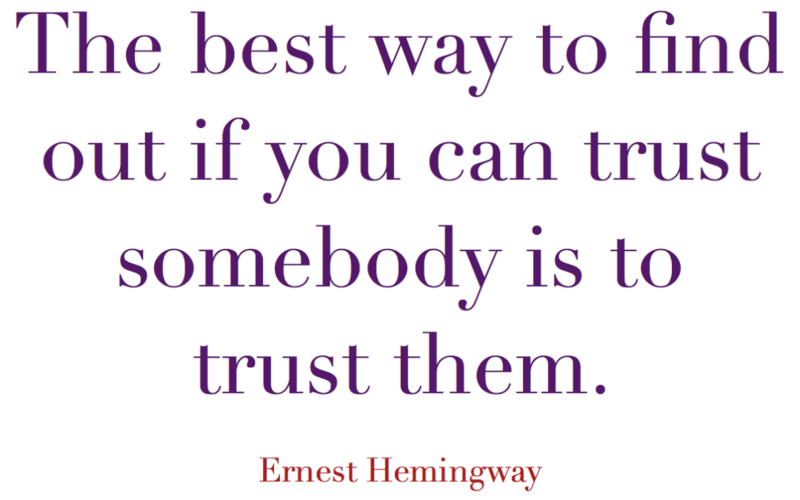 This is a big one for many people, the ability to trust another person. When we are young, this usually comes easily; we can be too trusting in people and often experience being taken advantage of in our naivety. Not trusting people comes from the experience of being hurt. So, how do you have faith in another after you’ve experienced pain or let down? I’ve often spoken of my past. If there’s anyone who shouldn’t trust people, it’s me. Yet, through a willingness to find peace, and because innately I find I am a compassionate person, I have been able to trust people even when they’ve hurt me. Sometimes, I’ve been proven wrong and I’ve had to admit I made the wrong decision, but thankfully for the most part, I have found the good in many. Trust is built on experiences. You learn to trust because we feel safe, we feel loved, we feel secure, listened to and taken care of. Trust is also broken based on experiences. We find someone doesn’t always tell us the truth, or lets us down, or doesn’t stand by their word. Here’s what I’ve found so far; expectations will most certainly always let us down. Sometimes, it’s not the person who’s let us down but our expectations of them. I’ve learned not to have expectations of people; if something happens that creates positivity, that’s bonus. That may sound pessimistic, but I prefer to view it as being realistic. Not having expectations of people also creates space for freedom, allowing trust to build. Imagine you have someone on a pedestal; your expectations of them are higher than they can live up to and there’s only one place to go when that pedestal teeters; down. They not only feel like they’ve failed you, you also have a negative view of the outcome. The result is mistrust, and certainly not intentional on either parties. We are human. We err. We fail. We learn. We succeed. It is in our destiny to go through these lessons. So instead of expectations, let’s create space for people to go through their life lessons. Let’s give them a cushion instead of a pedestal. Tumbling off of a cushion is a lot easier than landing from up high. Have faith in the person you are watching so closely. Step back, and give them space to move. Don’t judge; have compassion. If it’s something too momentous to forgive, if they have truly betrayed you, love them and forgive them anyway, for yourself; then let them go, with love. 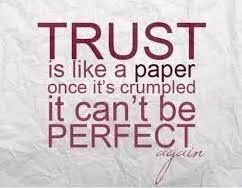 Sometimes, the trust is broken too severely to fix completely. We will always remember the hurt, even when the sharp edges dull with time. Other times however, we can find it in our hearts to move forward and renew our trust. This faith in each other I believe comes from a deeper place. Our ultimate connection to each other speaks volumes and helps us to heal from mistrust. Sometimes, the renewing builds a stronger tether, one woven from a new respect for one another, a deepening of faith. There is power in forgiveness, a kind that can overcome pain and help us to understand that a person’s betrayal isn’t about us; it is their lesson. Our lesson is in our choice to move forward with or without them.